One of disadvantages designing so cheap computer is that you have to give up some features which are too expensive. One of these features is RTC - real-time clock. RTC chip has its own battery to store actual time even when device isn`t plugged in. This chip costs about 10$. This is quite ennough to persuade RPi designers to do not implement this feature. Problem with storing actual time is partially solved by fake-hwclock package which writes actual time to text file every hour and at system reboot. At start, if no better source of time is present, time is set to one stored in that text file. Since RPi is disposing a RJ-45 port, we can use it as very precise time source within NTP. First we have to install package called ntp. Notice: As per advice from one of the visitors, the newer version of Raspbian have preinstalled timesyncd service. It can be used for the same purpose, but you can not have running both of them at the same time. To fix this you can stop and disable timesyncd service using these commands. Thats all, RPi is now synchronizing its time to NTP servers. By default it uses NTP servers which are generally too far from you. It has bad influence to time accuracy. So first go to page pool.ntp.org and find a location as near as possible. For me it is Czech Republic. To set NTP servers open ntp configuration file. Now you can restart ntp service. You will get some output like this. First letter have the most significant value of the table. * means actual time source, + means something like backup time source, - is ignored, but can become backup (+) at any time. First column shows IP adresses of NTP servers, second shows source of time for your NTP servers, third shows so called stratum. Stratum is number from 0 to 15 and shows number of hops from reference time (GPS clock, atomic clock...). That devices has stratum 0, but it is impossible to connect to them directly. For example, you have computer with sme kind of atomic clock conected (veeeery expensive - about 100 000$). Atomic clock box is stratum 0, your computer is stratum 1... Maybe you can also find stratum 16 which means untrusted time source. Column with "u" means that NTP server`s address is unicast. "When" indicates number of seconds passed since last response. "Poll" means interval between time requests, in seconds. "Reach" indicates success/failure to reach source. "Delay" indicates the roundtrip time, in milliseconds, to receive a reply. "Offset" is the difference between ntp server and your system clock in milliseconds. "Jitter" shows the difference, in milliseconds, between two samples. 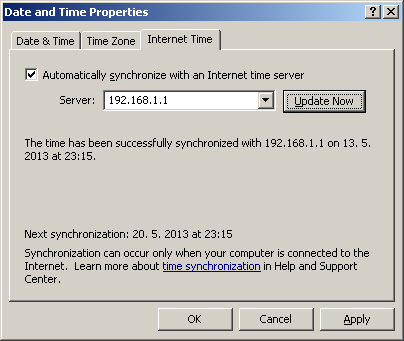 Now when RPi has synchronized its time, you can set it to pass this time information to devices in your local network. You only have to open configuration file of ntp daemon. And add a string that describes the hosts which requests will be answered. And also add this 2 lines. They will enable sending of broadcasts and multicasts containing time information for devices which accept them (Cisco, Juniper...)). Change first address in bold to broadcast address of your LAN. Do not change multicast address 224.0.1.1 since this addreess is assigned to NTP service by IANA and some network devices join this multicast group automatically. From now you can configure machines in local network to synchronize its time to RPi. For example in Windows XP double click the clock in tray > Internet Time > check Automatically synchronize with an Internet time server and insert RPi`s IP address.